Posted February 16, 2018 by Josette Farrell in News. Seán Kyne, Minister for Community Development, Natural Resources and Fine Gael TD for Galway West and Mayo South has said Project Ireland 2040 is a comprehensive plan which will help us to develop our country in sensible and sustainable way. Commented Minister Kyne: “Project Ireland 2040 contains both the National Planning Framework and the ten year National Development Plan through which €115 billion will be invested in vital infrastructure. “The National Planning Framework has been shaped by extensive public consultation and I am very encouraged to see many of the recommendations I made in my submission and in meetings and discussions with ministers and policy-makers in the final Plan. “The National Planning Framework will help us encourage and stimulate sensible growth in our cities and urban centres and it will help us to support and sustain vibrant communities across rural Ireland. “Project Ireland 2040 is the first time that we have an investment plan underpinned by a strategic planning framework. In Galway and the West Project Ireland 2040 will enhance regional connectivity and competitiveness, improve environmental sustainability and build a fairer, more equal Ireland where everyone has the opportunity to live in a strong community and reach their full potential. · Investment in Healthcare including –o A new emergency department to be built UHG. 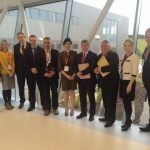 · Establishment of the Connacht Ulster Alliance Technological University of GMIT, IT Sligo and Letterkenny IT. “The Atlantic Economic Corridor features prominently in Project Ireland 2040. The AEC initiative which is one of my responsibilities at Minister of State at the Department of Rural and Community, will develop and maximise infrastructure, talent and enterprise assets along the western seaboard, to create economic hubs and clusters from Kerry to Galway to Donegal. Project Ireland 2040 sets out its vision for balanced regional growth. A key pillar of this vision is the sustainable development of cities outside Dublin. As one of these cities, Galway is well placed to benefit from Project Ireland 2040. It sets out a target for Galway to grow by at least 50% by 2040. There are a number of measures in the plan which enhance Galway’s significant potential to become a city of scale. Galway City will continue to play a key role in driving the West, with a greater focus on a more compact, public transport centred approach to development and addressing the issues of congestion that have developed as part of its economic success. The emerging Atlantic Economic Corridor (AEC) initiative will be supported through Project Ireland 2040. The AEC is a linear network from Kerry to Limerick, Clare and Galway, through the heart of this region to Mayo, Sligo and through to Donegal, the objective of which is to maximise infrastructure, talent and enterprise assets along the western seaboard, to create economic hubs and clusters. Galway City and County Councils have established that there is a need to provide relief from traffic congestion in order to implement smarter mobility and public transport measures. The proposed N6 Galway City Ring Road project is being developed to achieve this. The project is currently at Design and Environmental Assessment Phase. This scheme provides a bypass of Moycullen. The proposed scheme will reduce congestion in Moycullen, provide a safer route with better journey time certainty and will improve access to the West and in particular Connemara. Galway BusConnects (Estimated cost €200m, estimated completion date 2027) will deliver a rationalised network of five high-performing cross-city routes. All routes will serve major city centre trip attractors as well as linking all major destinations across the city. Galway BusConnects will comprise the same elements as Dublin BusConnects. As part of the programme delivery, a network of park & ride sites, serviced by the more efficient bus network, will be put in place. Health investment projects in the West include the development of primary care centres and the upgrading and replacement of community nursing units across the western region. · A new emergency department to be built at Galway University Hospital. · Replacement and further radiation oncology facilities to be developed at Galway. · New dedicated ambulatory elective-only hospital facilities to be introduced in Galway. · New patient accommodation to be provided at Portiuncula Hospital, Ballinasloe. The Government committed in principle to provide €15m to the project. The theme of Galway 2020 is Making Waves. The year-long programme is designed to make waves across the whole of Ireland and Europe and to celebrate new voices, young voices, and traditions, both new and old. This is required to provide suitable, safe, efficient and hygienic facilities to further develop a modern offshore Irish fishing fleet and and increase landings into our Fishery Harbour Centres. Investment projects in towns and villages of less than 10,000 in Galway will be in a position to benefit from a new Rural Regeneration and Development Fund which will invest €1bn in promoting rural renewal, to help towns, villages and rural areas to grow in a sustainable way. Project Ireland will see a €285 million investment in our national heritage. This includes Coole Park and Connemara National Park in Co. Galway. Project Ireland supports Gaeltacht areas across the country, for example by prioritising investment in the development of tourism facilities in Ceantar na nOileán in the Connemara Gaeltacht and increased investment to enable the creation of 1,000 jobs every year in Gaeltacht areas across the country including Galway. The development, in conjunction with the local authority, of improved pier infrastructure on Inis Oírr and the construction of new co-operative offices and community facilities on Inis Meáin. Completion of the Kildare and Meath sections of the Galway to Dublin Greenway in 2018/2019. Greenways can have a significant impact on the area in which they are located through increased tourism and local business opportunities. Consisting of Galway-Mayo Institute of Technology (GMIT), Institute of Technology Sligo, and Letterkenny Institute of Technology. New student residences, completion of the Human Biology building and other campus upgrades.